How many different pots, pans, platters, dishes, glasses, and utensils did you use for Thanksgiving? I bet it was a lot! You can’t carry nearly that much on the trail. If you did, you’d be the turkey. So what are the best things to use for your camp kitchen? Cooking is a skill that we should all have, but you really only need to know how to boil water (lucky for some of the ill-prepared kids on the trail!). My last review was on Stove and Fuel Options so you can boil water but what should you boil your water in? Warning: I am going to be comparing items by how many ramens they can cook at once. We loved that the packing footprint was small because everything nexted. We used the GSI Outdoors Pinnacle Dualist (there is a cheaper version called the Halulite). We ended up getting rid of some of the pieces. The best part was everything fit within each other (even the stove and fuel) so it could be stored in the pot like cute Russian nesting dolls! I’ll break down the package to each specific piece of equipment and list its uses, if there were any. Utensils – First to go were the plastic telescoping foons. There is no sugar coating the foons. They plain sucked. 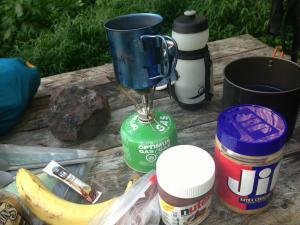 I think the foon (aka spork) is the best utensil for the trail because most of what we were eating was soup or pasta. 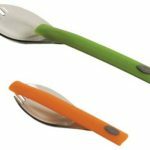 The telescoping feature was created so they could be stored in the bowls but if you tried to use the foon like a fork, the stabbing force caused the foon to retract. They were hard to clean the tracks which the foons telescoped on. While trying to stir some ramen noodles, one of the foons broke off of the handle because they were made from flimsy plastic. The still somewhat functioning foon went into the next hiker box we could find! We replaced them with the Sea to Summit Alpha Light Spork and Alpha Light Spoon-Long. First off, I like that they named it a spork instead of coming up with something new. Don’t mess with what works! 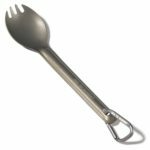 Everyone knows what a spork is so why call the same thing a foon?! Alex went with a 8.5 inch spoon (versus my 6.5 inch spork). 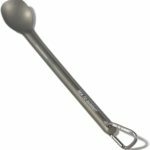 Its extra 2 inches made it great for getting the last morsels out of a deep peanut butter container or stirring the bottom of a pot filled with 2 ramens. The aluminum construction meant they wouldn’t break during use or storage. We actually ended up buying 3 of these because I left our first 2 in the outdoor drying rack at Upper Goose Pond Shelter. You’re welcome whoever got those!! I bought Alex another one but punished myself by using a cheaper option. At $7 and $9, they aren’t cheap at $1 per inch but worth it! 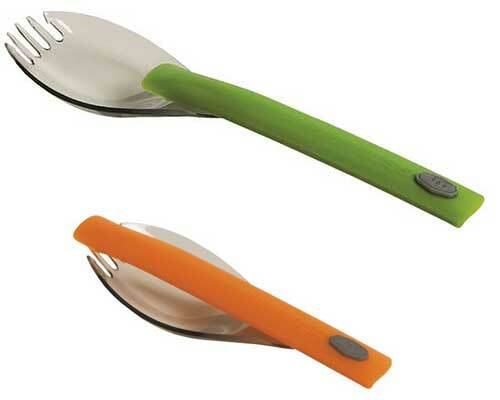 There are similar utensils out there but this is what was at the store when we needed something. One only weighs 0.3 oz or 0.4 oz. You could always be a barbarian and eat with your hands but if you want to keep some civility and make friends on the trail, choose your utensil wisely! We hated these and they broke pretty quickly. Pots – The 2 ramen (1.8L) capacity pot fit the right amount of food for one person to be cooked in one sitting. Alex and I had to play rock-paper-scissors on who got to eat first but cooking twice was better than having to cook more than twice using a smaller pot or having to carry a bigger pot that would fit both our meals. The lid fit well to efficiently keep heat in and doubled as a strainer. The handle was sturdy and rotated so it wouldn’t stick out during storage. You just had to be careful not to squeeze when lifting the pot so it didn’t become loose. The only other drawback to this pot its height. It made for a higher center of gravity so we made sure it was well balanced on our MSR Pocket Rocket stove. The capacity, even with the bowls stored inside, was large enough to store a fuel canister and our stove inside the pot making a smaller footprint in our packs. Dinnerware -Bowls are the best for containing all your heart could want to eat! You don’t really need a plate and the size that you’d want would make for awkward packing. The Dualist came with 2 bowls and 2 insulated “mugs” which were basically bowls that fit in the other bowls that had a lid with a sip hole. Each of those fit 1 ramen each. It was nice to have 2 bowls because after whoever won rock-paper-scissors was done cooking, the food could be kept warm and eaten from the bowls leaving the pot free for the next batch of cooking. Having 4 bowls was just added luxury if we wanted to make tea while we were eating but since they were shaped like bowls, it made drinking weird, even through the sip hole. We could also just wait until we were done eating and use the other bowls. Logic dictated we reduced our carrying capacity by 2 mug/bowls. If you’re traveling solo, skip the bowls. Just eat from the pot. Alex’s choice for solo cooking. Cups/Mugs – Alex drinks coffee, and to satisfy his urges, he used a titanium camp mug to heat up water for his single serving black goo. Here is his first contribution to these reviews! *Drumroll… So I (Alex) started out just using one of the bowls for coffee and tea, but quickly got sick of having to sip out of a plasticky tasting bowl. Call me a pre-madonna, I guess! Eventually, I broke down and bought a Snow Peak Titanium 450 Mug after maybe about 2 months on the trail. At 2.4 oz, it’s super light and makes your day a little brighter as a coffee or tea drinker. It just feels good to hold a hot mug in the morning and gaze out through the woods before you start another long day of hiking. As a solo hiker, which I became during the last 400 miles of the trail, this mug is indispensable. I got rid of my cook kit all together and only carried my spoon, pocket rocket (which fit nicely inside of my mug with a lighter, sealed in a plastic bag), and mug. This allowed me to lose a little pack weight, and gain a bunch more space in my bag. If I had a need for coffee or the occasional hot breakfast, the mug would heat that up. Lunch was usually a sandwich or cold snack, and occasionally coffee. And dinner was usually a ramen or two, with or without a sandwich. The one disclaimer is that you can only make one ramen in the mug at a time, but the water starts to boil almost as soon as you get the burner on the mug. Overall, I would say this mug might be slightly frivolous as a hiker that has a companion with them throughout the duration of the hike, but still worthwhile if you enjoy having your own nice mug! As a solo thru-hiker though, I would say that this mug is the end all be all for heating up water, eating out of, and all of your hot beverage needs. You will end up saving space, weight, and plenty of time as clean up is a breeze! Kitchen sink – The bag the pot is stored in doubles as a camp sink. You can fill it with water and it won’t leak. We didn’t really use it as a sink because we didn’t use enough water for dishwashing to justify using it. Plus, it would make that wet for storage. It was good for keeping any soot from the pot off other stuff in our bag (sometimes we’d cook on the campfire) but it could also be left off trail if you clean your pot well or if you use a canister which doesn’t leave much soot/residue on your cookware. Dish soap – We used Dr. Bronner’s travel size soap for everything (except for my hair because it would turn it into a rats nest). It works on the body and on your dishes! The small travel size also fits right in one of your nesting bowls. What it comes down to is how much you’re going to be cooking. If you are cooking for 2 and you can control yourself to be patient while your partner eats, just use a big pot which will also store your stove and fuel. If you’re solo, you could still use a big pot in case you hook up with another hiker… 😉 If you’re an ultra-lighter, you should go with something like the titanium mug Alex bought. It is a bit pricey for just a mug but all ultra-light gear is expensive so you should be used to it!